Don’t sit on your ukulele! Sitting on your ukulele is maybe not the best thing to do. I’ve never heard a ukulele being played well while being sat on. If you sit on your ukulele you have a very good chance of breaking it. This ukulele was brand new and was sat on by accident. The result was a broken ukulele that can no longer be played. However, it’s important to recycle the bits from the ukulele. If you’re into weaving or are considering starting, you can make yourself a wrist bracelet from the strings of the broken ukulele. By wearing them you’re sure to be reminded, not to sit on another ukulele again. 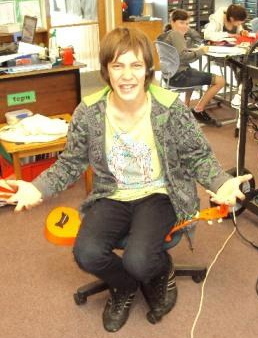 Trey, the boy in the photograph, kindly volunteered to sit on the already broken ukulele, as he feels it is a good way to start a modelling career – good on you Trey! Ouch! I guess you could always turn it into some kind of modern art piece and hang it on the wall?